What Do I Think Colored Fonts Are? A mess waiting to happen. Any professional designer is going to use a Pantone color to match a client’s colors from some sort of style guide. I can see this creating all kinds of problems when inexperienced designers use these fonts and create separation and color matching nightmares for professional production artist who are trying to convert their fonts into functioning printable files. 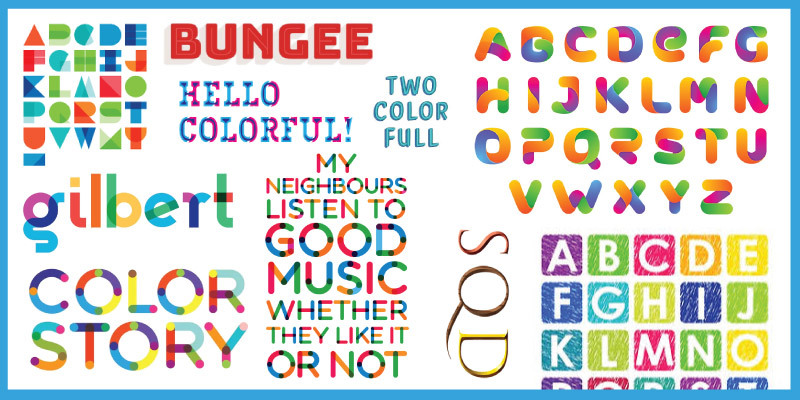 Do Designers Need Colored Fonts? In my opinion, graphic designers are pretty great at coming up with inspiration all on their own. That’s kind of their job and what they do well. My fear is that some clients with loose reins on their employees will start using these fonts on their social media, internal stationary, and signage because of the way they look. The perceived ease of use may eventually become an agency nightmare to fix, as they find themselves off brand down the road. Colored fonts are new, and I think this is something to keep an eye on. It’s too early to call this any sort of emerging technology for professional designers, especially with the fragility of brand integrity- but time will tell if these are a fad or are actually valuable. Currently there are mainstream version of Trajon, Times and some others that are colored with effects that are available for Mac and Windows. As an added minefield, some of the fonts available on dafont, typekit and myfonts include colored version too. So be mindful and make sure your clients have a font, logo and color style guide at all times.